This series is meant to pick up where the â€œColt Starting Philosophyâ€� left off, and take you through the foundation building stage and enter the performance horse world. Martin takes a 3-year-old from ride 5 to ride 11, as you watch the progression of each ride you will see the quiet manner the colt maintains as he advances through the basic maneuvers to establish a well rounded foundation. 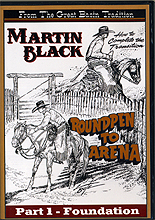 â€¢ Martin grew up working on the family ranch and after High School, left home to work on other Ranches with top Horseman in Idaho, Nevada and California. â€¢ At age 24 he took a management position on a 1.25 million acre ranch running 400 horses and 15,000 head of cattle in Northeast Nevada. â€¢ After more than 30 years of cattle being the primary source of income and horses being the secondary, Martin decided to make his living working with horses. With his reputation on the ranches and in the arena, it wasn't long before he was traveling coast to coast in the US, Australia, Europe, and Brazil. â€¢ Along with contract colt starting around 400 horses annually, Martin also does some public and private clinics. â€¢ Martin has worked with Hall of Fame and All Time Leading Trainers of cutting, reining and race horses. â€¢ Started Pleasantly Perfect who went on to win in excess of $7 million. â€¢ Started Smart Little Scoot who is the All Time Leading money earning son of Smart Little Lena. As well as numerous other champions in Cutting, Reining and Reined Cow Horse. â€¢ Earned over $75,000 in Stock Horse and NRCHA events, as well as roping, saddle-bronc and camp drafting competitions. â€¢ Competed in the Worlds Greatest Horseman 3 yrs in a row. Scored in the top ten in Roping, Reining and Cow-working go-rounds. â€¢ Multiple finalists at NRCHA World Show.